Block! 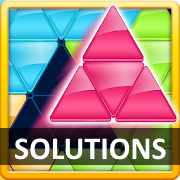 Triangle puzzle: Tangram by BitMango solutions, walkthrough, cheats all levels for android, iphone, ipad, ipod. 'Easy to play' game for all ages. Move blocks to fill up the triangle and collect the block pieces to level up! Smooth effect for block puzzle game! Play easily and quickly. Over 300+ puzzles are unique and full of fun and amazing challenges! If you can't find the solutions for a level in Block! Triangle Puzzle, just pick it below and you will see a image with how the level looks when it's solved! Can't solve Block Triangle Grandmaster Level 37. Hey other than 11Mania and Grandmaster I finished all the other levels. Maybe I could help you with getting the rest of them. I have screenshots for all of them, but it will take 2-3 days until i'll post all the missing levels, if you need the solution for a certain level, fast, just leave a comment and i'll post it. Hi admin, i need the post for 11 mania level 29. You know you're missing the GrandMaster header right? Because it goes from 11Mania and the, RegularA, but there are GrandMaster levels. added all 80 levels for grandmaster. Is there no 12 mania levels on here?? added 12 mania levels, will add Champion pack too, soon..